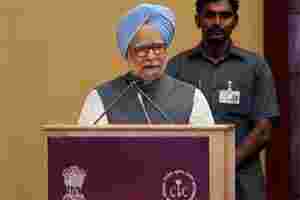 New Delhi: Prime Minister (PM) Manmohan Singh on Friday signalled the government’s intent to review the Right to Information (RTI) Act, which could put curbs on the information that can be accessed through the path-breaking legislation. “Even as we recognize and celebrate the efficacy and the effectiveness of the Right to Information Act, we must take a critical look at it. There are concerns that need to be discussed and addressed honestly," Singh said while addressing the annual convention of the Central Information Commission (CIC). “The Act does have provisions to deal with privacy issues, but there are certain grey areas that require further debate," Singh addded. Activists and politicians opposed the move, saying this would defeat the purpose of the legislation. The PM’s remarks came amid fears among RTI activists that the government may dilute the legislation. At least two cabinet ministers have recently expressed their concerns. While corporate affairs minister M. Veerappa Moily said the Act “transgresses into the independent functioning of the government", law minister Salman Khurshid complained that the “misuse" of RTI had hit “institutional efficacy and efficiency". While emphasizing that the government wanted to make the Act an “even more effective instrument for ensuring transparency and accountability in administration", the PM also highlighted fears of misuse. “Another concern that has been raised is that the Right to Information could end up discouraging honest, well-meaning public servants from giving full expression to their views... The Right to Information should not adversely affect the deliberative processes in the government." Debate over the scope of the RTI Act gained momentum last month when a Union finance ministry note accessed through RTI seemed to hint that P. Chidambaram could have prevented the second-generation (2G) spectrum allocation scam. In his address on Friday, Singh also referred to the exemption clauses under the Act. “We must also take a critical look at the exemption clauses in the Right to Information Act to determine whether they serve the larger good and whether a change is needed in them," he said. RTI activists are opposed to increasing the list under section 24 of the RTI Act, which excludes intelligence- and security-based organizations from the Act’s purview. The department of personnel and training (DoPT), through a gazette notification in June, added the Central Bureau of Investigation, the National Investigation Agency and the National Intelligence Grid, increasing the list of exempted bodies from 22 to 25. DoPT had earlier also proposed several changes to the Act, including limiting an application to one subject matter and annulling it in case of the applicant’s death, a move that was criticized by the United Progressive Alliance chairperson Sonia Gandhi-led National Advisory Council (NAC) in March. NAC had recommended that both the amendments be dropped. In his speech, the PM also underlined the importance of the RTI Act as being a “powerful tool" in curbing corruption and improving governance. “We wish to make the Right to Information an even more effective instrument for ensuring transparency and accountability in administration," he said. Satyanand Mishra, chief information commissioner, highlighted the need of government accommodation for CIC’s office in the Capital and financial autonomy. He also said that if the government was looking at Lokpal being a constitutional authority, then the information commissions have “greater right and justification" for this status. Meanwhile, the main opposition Bharatiya Janata Party criticized Singh’s comments, saying that the government is scared that it will lose its credibility entirely if the RTI Act continues to exist. “Wasn’t it an attempt by the Prime Minister to dilute the importance of RTI Act? Why does he want to debate on RTI? Is he trying to say that RTI is a wastage of time and money?" Rajiv Pratap Rudy, party spokesperson, told reporters on Friday. RTI activist Subhash Chandra Agrawal said the PM’s speech was “disappointing" as it “hinted" at dilution of the Act. “We will resist any dilution of the Act and we hope that the Sonia Gandhi-led NAC will intervene if there is any attempt at amending it," he said. Aswathy Gopalakrishnan in Hyderabad contributed to this story.